A prime cost sum is the cost of an item that has either not been selected or the price was unknown at the time the contact was entered into. The builder must make a reasonable allowance in the contract for this item. This will not be included in the specifications because these will only list material and labour for which price and quantity are known. For example, a toilet is shown on a plan but is not listed in the specifications. 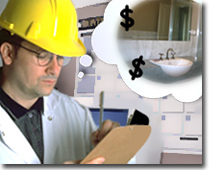 A toilet can range in price from $100 - $1,200 so the builder would put a prime cost sum (PC sum) in the contract. The PC sum must be a reasonably accepted price for that item which is generally based on the builder's past experience and the client's budget. The amount entered in the contract for the item is subject to change until the client decides exactly which item they want. If the PC sum in the contract is higher than the item chosen the builder will pay the client the difference. If the price of the item chosen is greater than the PC sum the client will pay the builder any difference plus a profit margin as stated in the contract.